Baseline findings suggest that households assigned to receive the LTA activity have a low incidence of disputes, with only 30 reported for the past 12 months in the treatment sample versus 38 disputes in the control group. USAID/Tanzania, as part of the Feed the Future initiative, is funding the Land Tenure Assistance (LTA) activity to clarify and document land ownership, support local land use planning efforts, and increase local understanding of land use and land rights in Tanzania. DAI implements the LTA activity under a $6 million four-year contract that began in December 2015. The LTA activity assists villages and the local District Land Office (DLO) in Iringa and Mbeya Districts in completing the land use planning process and delivering Certificates of Customary Right of Occupancy (CCROs) in select villages. It also delivers guidance on land laws, CCROs, and land management. The LTA activity is using the Mobile Application to Secure Tenure (MAST) mobile app to facilitate the mapping and CCRO process. The LTA activity will be implemented in 36 villages; 6 that were chosen for initial implementation by DAI and 30 that are part of the impact evaluation in Iringa District. To test how mobile mapping and facilitation of land tenure certification affect income, women’s empowerment, dispute prevalence, and other factors related to land use and tenure security, USAID’s Office of Land and Urban commissioned a third-party evaluation through the Agency’s E3 Analytics and Evaluation Project to design and implement a randomized control trial (RCT) evaluation of the LTA activity. The impact evaluation uses a cluster randomized design with villages randomly assigned to receive the LTA activity or serve as a control. Villages in Iringa tend to change over time, with villages subdivided and splitting. A unique aspect of this evaluation is a field reconnaissance trip that the evaluation team conducted in coordination with DAI, the Iringa DLO, and the Government of Tanzania (GOT) to assess the potential pool of villages ahead of randomization. This trip built support for the evaluation within the DLO and GOT, and assessed potential implementation challenges. To ensure implementation fidelity, the evaluation team and DAI are collaborating to randomize assignment over two phases. Phase 1 is from April 2017 to September 2017 and Phase II will start in November 2017. In each phase, 15 villages are randomly assigned to receive the LTA activity and 15 are randomly assigned to serve as control villages. A household panel survey of a random sample of respondents in each of these 30 villages precedes each LTA implementation phase, as well as a midterm survey for Phase I villages while the first Phase II villages are surveyed. The evaluation will then conduct an endline survey of all previously surveyed households in March 2021. Focus group discussions with women, youth, and LTA beneficiaries at endline. In the Phase 1 baseline, the evaluation found general overlap in key demographic characteristics and outcome variables between the group randomly assigned to receive the LTA activity and the control group. The evaluation analyzed within the treatment group to assess how male and female-headed households differ. There were 122 female-headed households and 267 male-headed households. The figure below shows the distribution of parcel sizes in the treatment group by gender. 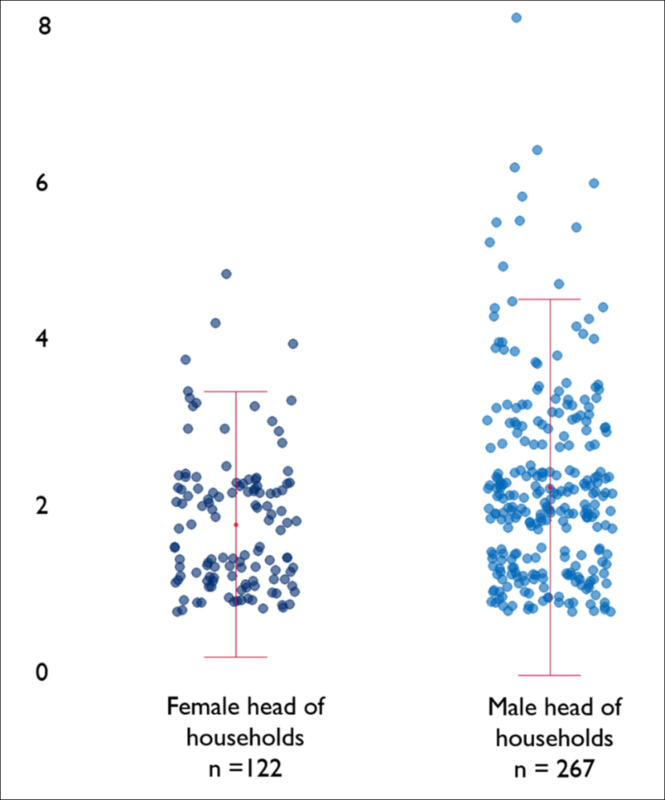 The red dots show the average for each head of household group, with male-headed households reporting an average of 2.13 parcels, while female-headed households had an average of 1.67 parcels. Baseline findings suggest that households assigned to receive the LTA activity have a low incidence of disputes, with only 30 reported for the past 12 months in the treatment sample versus 38 disputes in the control group. The evaluation team found that about 32 percent of the treatment group (n = 124) and 28 percent of the control group (n = 108) felt there was “a very high risk” of expropriation should they leave their parcels fallow. 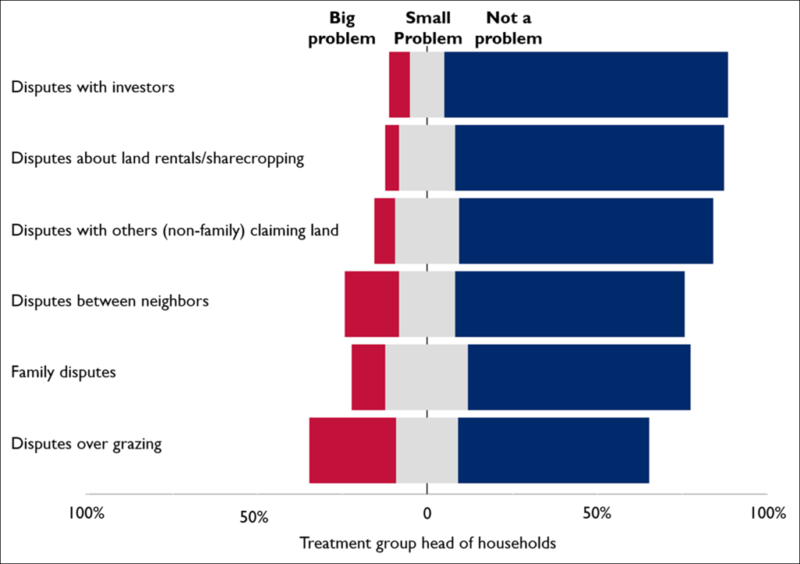 Sampled households made few agricultural or environmental improvements in the past year.